Dog walking insurance covers public liability, attracts more business and gives you real peace of mind. Dog walking insurance is essential to professional dog walkers. Working with dogs involves risk. And working with people’s beloved pets is trusted position with a lot of emotional and financial responsibility. That’s why dog walkers with professional dog walking insurance get more customers and sleep a lot better knowing they’re covered – whatever happens tomorrow! Unlike business insurance for retail shops or an office based service, Dog Walking Insurance from PBI has been created for you when you work with animals. At it’s heart is dog walking public liability cover with ‘Accident and Injury cover. 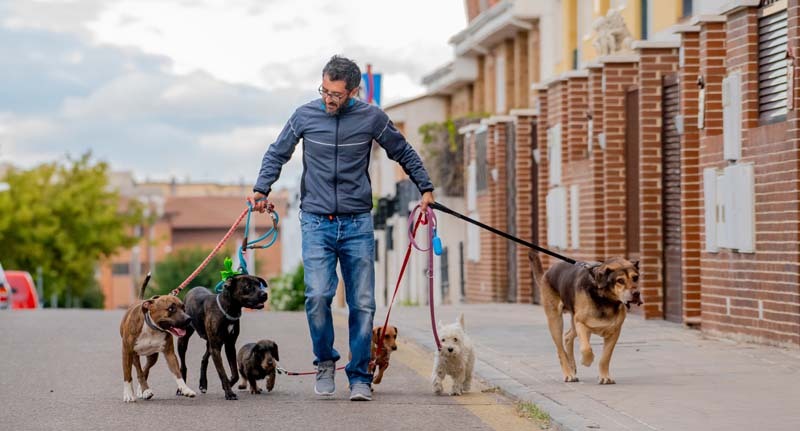 In short, these insure you against the most common and expensive things that can happen to you as a dog walker. That is; a dog causes an accident or injury or damage to someone elses property; a dog is injured or lost due to your negligence; a dog is accidentally injured in your care but without fault. We also include FREE ‘Loss of Keys‘ cover in case you lose the clients house keys in the park and need to replace all their locks! If you’re starting up a new dog walking business, then our basic core cover is a great place to get your new pet businesses off the ground. Already running a growing pet business? PBI add-on insurance options grow with you. Including employers liability for your team, equipment insurance for your gear, glass insurance for your shop front and much more. Since 2004 we’ve been the experts in dog walker insurance. Providing insurance to thousands of professional dog walking companies and also a lot of free friendly advice to new dog walkers along the way! Questions? More information? Contact us during office hours on 01284 736 874 for a chat with a pet business insurance expert.